Subscribe to our email list to receive timely Texas Hurricane Harvey recovery updates, information and resources. Visit the Office of the Texas Governor’s website at gov.texas.gov/hurricane to find links to recovery pages such as RebuildTexas and HoustonRecovers, consumer protection and insurance help lines and other services. Interact with us, join the conversation and get breaking updates on the FEMA Harvey Facebook page at facebook.com/FEMAHarvey/ and follow us @FEMARegion6. 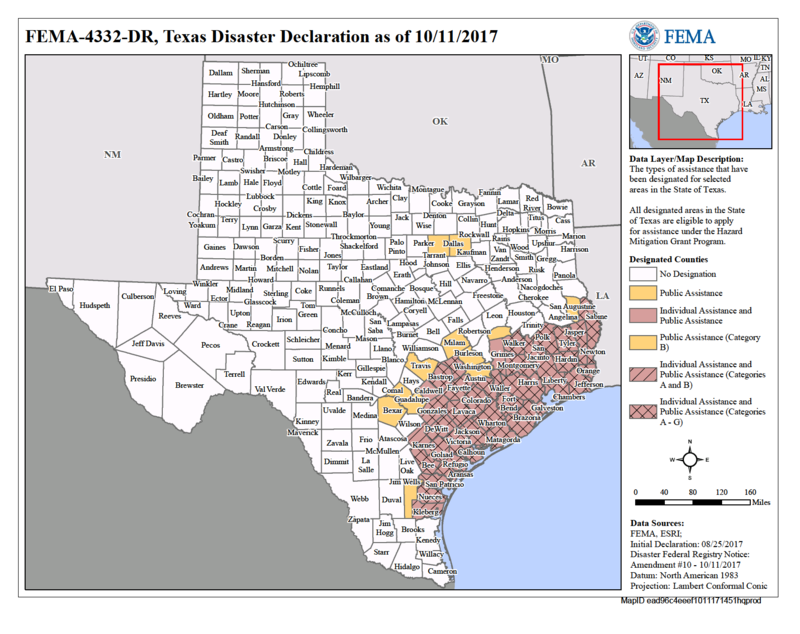 For program fact sheets and recovery guidance, visit FEMA.gov/Hurricane-Harvey/. Immediate Disaster Case Management. Call the U.S. Department of Health and Human Services at 855-742-5989 to talk with trained case managers who can assist recovery by referring you to available resources. If you need help cleaning up your flood-damaged home, call (844) 965-1386. In support of Texas 2-1-1, the Cleanup Assistance Helpline is helping connect Texas survivors with the services they need in their community. Crisis Counseling. Call the federal Disaster Distress Help Line at 800-985-5990 or text TalkWithUs to 66746 to talk to a professional who can help you cope with emotional distress from the storm. Help for veterans. Call the U.S. Department of Veterans Affairs’ Health Resource Center Disaster Hotline at 800-507-4571 or visit the VA website at va.gov/. Older adults and those with disabilities or access or functional needs. Contact your local independent living center, or call the Texas Health and Human Services Commission’s Aging and Disability Resource Center at 855-937-2372. You can also visit its website, hhs.texas.gov/services/aging/long-term-care/aging-disability-resource-center. Disaster Unemployment Assistance (DUA). If you are out of work or lost income due to Hurricane Harvey and do not qualify for regular unemployment benefits, you may be eligible for DUA. Visit the Texas Workforce Commission website at twc.state.tx.us/ to apply. Job Search. If you lost your job due to Harvey, visit WorkInTexas.com or the Texas Workforce Commission website at twc.state.tx.us/ for information. Disaster Legal Services. Call the Disaster Hotline at 800-504-7030 to receive free legal assistance. Visit the National Disaster Legal Aid website at disasterlegalaid.org/txhurricaneharvey/ for other sources of legal assistance. Tax relief. Visit the IRS website at irs.gov/newsroom/tax-relief-for-victims-of-hurricane-harvey-in-texas for information on tax relief for Harvey survivors. Stay in touch with FEMA. If you haven’t registered, need to update changes to your contact information or find more information on types of assistance, call FEMA at 800-621-3362 or go online at DisasterAssistance.gov. FEMA provides information in alternate formats, including these foreign languages: Spanish, Vietnamese, Chinese, Arabic, Burmese, Cambodian, Hindi, Korean, Tagalog, Thai and Urdu. For tips and guidance on disposing of animal carcasses left by Harvey, go to TCEQ's hurricane response page. Price gouging occurs when a supplier marks up the price of an item more than is justified by his actual costs. Survivors are particularly susceptible because their needs are immediate, and have few alternatives to choose from. If you find price gouging, contact you the Texas State Office of the Attorney General. The following materials comprise a current collection of NFIP resources, fact sheet and infographics developed in response to hurricanes Harvey, Irma, Maria, as well as some other products, available for your use. NFIP Substantial Damage "What Does it Mean?" Esta página explica el proceso de reclamaciones y los pasos a seguir mientras archiva y trabaja con su ajustador y agente. ¿Cómo presento mi reclamación contra inundaciones? FEMA’s How do I File My Flood Claim? This page offers more details on each of the steps below, along with more information for Hurricane Harvey survivors who have flood insurance with the National Flood Insurance Program. Note for Hurricane Harvey Survivors: Although ordinarily required within 60 days from the date of loss, completing a Proof of Loss (POL) will be waived for a period of one-year. The insurance company will accept the adjuster’s report to pay your claim. You will need a POL if you find additional flood damage or if you disagree with what the insurance company pays you. The Hazard Mitigation Grant Program (HMGP) provides funding for long-term public assistance mitigation measures following major disaster declarations. FEMA's 404 Mitigation Program provides funding for damaged and non-damaged facilities based on a percentage of dollars obligated to the PA and IA programs. Summary of FEMA's Hazard Mitigation Grants: 404 and 406. To report a missing child, contact the National Center for Missing & Exploited Children at 1-866-908-9570. Also, read this fact sheet on keeping children safe after Hurricane Harvey. Connect to volunteer. Trusted organizations operating in the affected area know where volunteers are needed and can ensure appropriate volunteer safety, training, and housing. Thank you for your interest in helping the survivors of Hurricane Harvey, there are other ways to help. When disaster strikes, America looks to FEMA to support survivors and first responders in communities all across the country. We are currently seeking talented and hard-working people to help support the response and recovery.